Small pallet garden of succulents. The Teaching Garden is tucked into an alcove behind the Fairlington Community Center (FCC), the long-time home of the Arlington and Alexandria branch office of the Virginia Cooperative Extension Service (VCE). It is one of several horticultural learning opportunities which Arlington County included in the FCC redesign master plan at the VCE’s request. Constructed as part of the FCC renovation in 2007, the Learning Garden has two large raised beds and several in-ground planting areas. Wide walkways provide space for containers and a bench under a shade tree near the back entrance offers a quiet place to sit and relax. 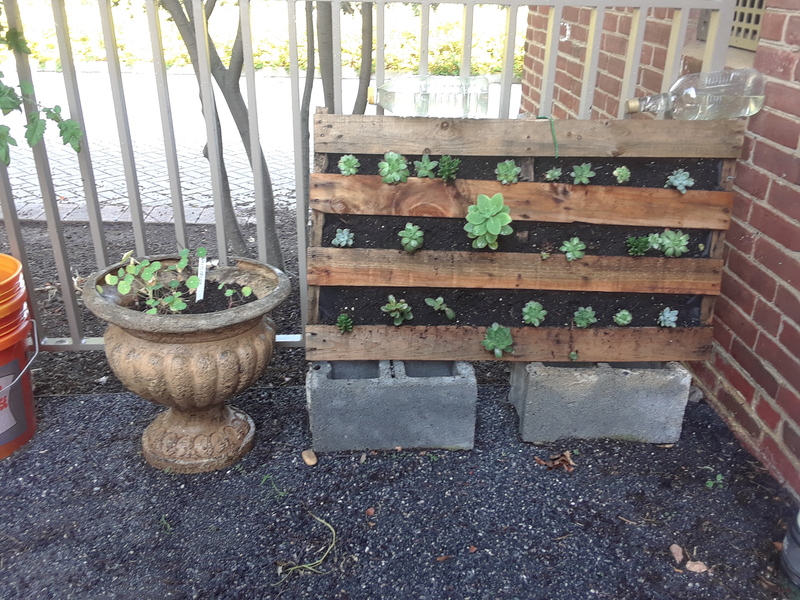 This entry was posted in Fairlington Gardens, Teaching Garden and tagged Fairlington Community Center, Teaching Garden, VCE. Bookmark the permalink.